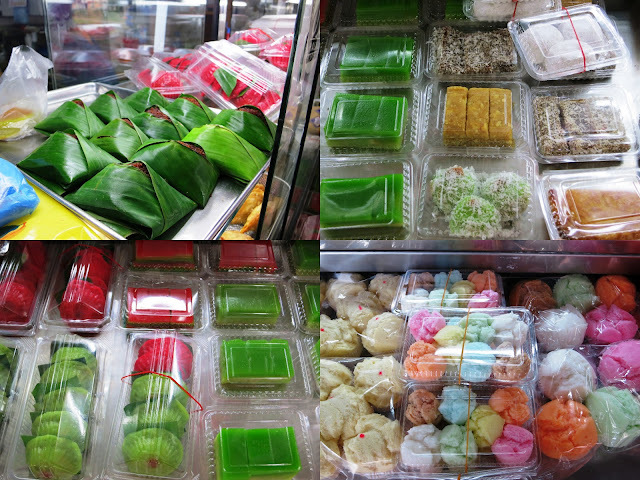 PinkyPiggu: Lek Lim Nonya Cake Confectionery ~ Traditional Handmade Goodness! Lek Lim Nonya Cake Confectionery ~ Traditional Handmade Goodness! In this advanced world where technology reigns and machines gradually take over what humans can do, Lek Lim Nonya Cake Confectionery holds dear to artisan traditions and retains an element that is mostly lacking nowadays ~ The human touch. Since the 1960s, they have been churning out traditional nonya snacks, all labouriously made by hand! Lek Lim began humbly by selling traditional Nonya Cakes (or better known in local term as Nonya Kuehs), from their home kitchen in 1968. They started selling Ang Ku Kuehs in the 1980s which made them very popular. Soon, their operations expanded to a proper shop in Bedok where they stayed till now. The delish kuehs has certainly kept the nearby residents belly happy. Business grew purely by word of mouth and hawker stalls, restaurants, food caterers and hotels began taking supplies of kuehs from them. It wasn't until 2 years ago when Gavin Sing, the 3rd generation owner, took over the family business that Lek Lim began their presence in social media with the set up of their website and facebook page. The fact that Gavin gave up his career in the oil and gas industry to continue this family business much explains his pride and passion for it. He fiercely upholds the belief that handmade kuehs is better than factory made ones, refusing to go the way of machinery even though it may mean higher productivity and increased revenue. 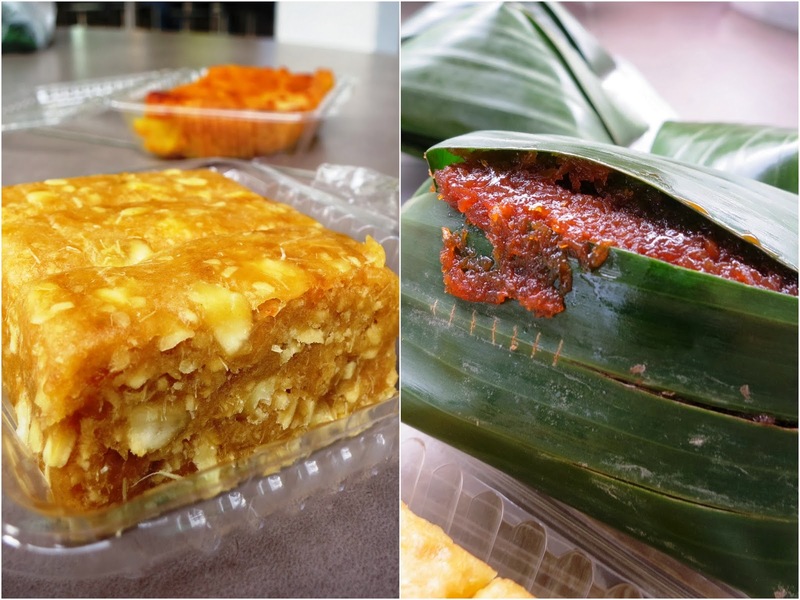 "The individual attention that each kueh gets when made by hand can't be replaced. The texture is different", he said. It is this dedication and commitment to produce good quality, affordable kuehs to his customers which I admire. Look at the colourful array of kuehs available! and this is only a fraction of what is produced daily by Gavin, his family and their team of workers. They start their day as early as 4am in the wee hours of the morning to make all of these kuehs freshly, tirelessly, day after day. The kuehs do not contain any preservatives and can only last 24 hours if unrefrigerated. I would suggest eating them on the day itself to taste them at their best. Our Muslim friends can enjoy all the kuehs too as it's Halal certified. The kuehs are also a treat for the kids at the Moral Home for The Disabled near Eunos MRT. On Sundays when they close their shop early, Gavin will drop off their extra kuehs there. Besides their signature Ang Ku Kueh, other kuehs like Soon Kueh, Peng Kueh and Gu Chai Kueh are also very popular. Some regulars even know the specific time the kuehs will be ready and come specially to get them as soon as it's fresh out of the steamers! Judging by the constant stream of customers when I visited the shop one afternoon, there is no question to the kuehs' popularity. To move along with the changing times, fried stuff like Curry Puff, Sardine Puff, Spring Roll and Yam Cake are being introduced to the menu. The savoury delights appeal to both the older and younger generation and gradually became the top sellers. This PinkyPiggu is excited to have a chance to make her own Ang Ku Kueh when she receive the invitation from Gavin! 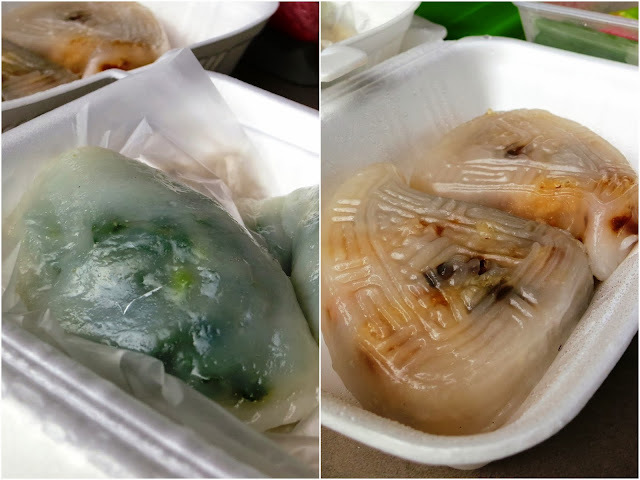 Ang Ku Kuehs are basically a steamed pastry made of glutinous rice flour with fillings such as peanut, mung bean or grated coconut. Shaped like a tortoise which symbolises longevity for the Chinese, they are considered to be auspicious items and are distributed to family and friends during happy occasions such as baby showers by the host. It's a snack I can't resist eating even though they are a tad oily. Different color doughs are used to differentiate the different fillings encompassed within. It's usually red for the peanut and mung bean paste, and green for the coconut paste. 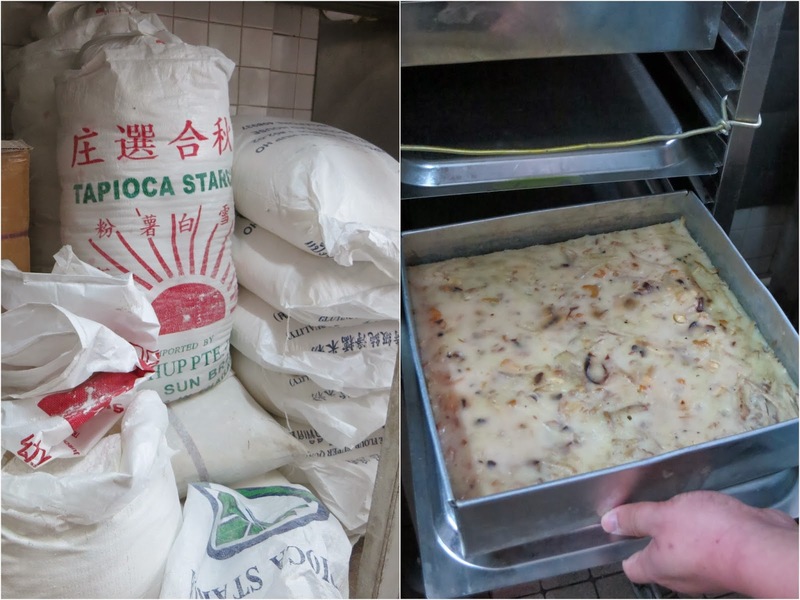 Gavin has already prepared the dough and fillings for me, so what I have to do is just to mould the Ang Ku Kuehs into shape. Sounds simple enough but doing it isn't easy at all. There isn't an exact measurement to how much dough to use for each kueh, so it's purely agak agak gauged by what the eyes see and what the hands feel. It takes a skilled worker to get this consistently right, something which you can only gained by experience. The amount of pressure the fingers applied to the dough must be just right too. 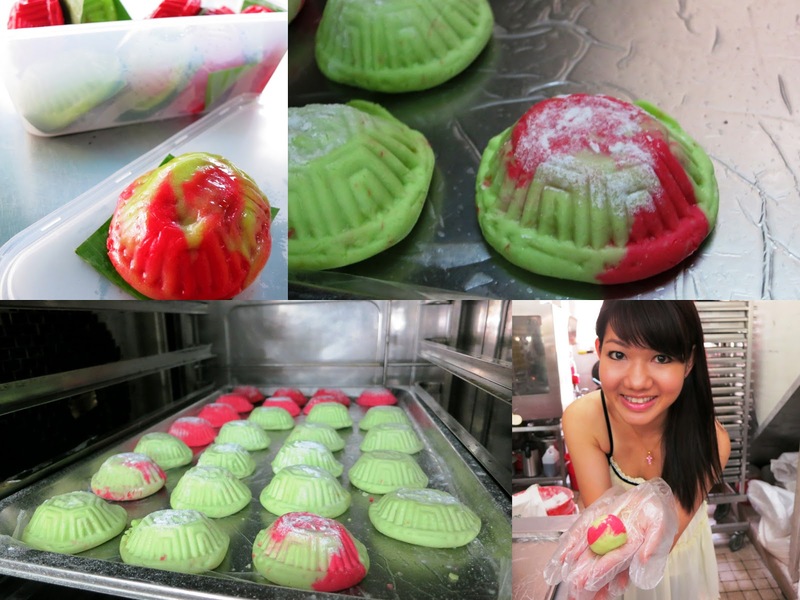 Tough as it may be, I still had fun and even made a PinkyPiggu's Special Edition Ang Ku Kueh! A mixture of red and green dough filled with my favorite peanut filling! Making the Ang Ku Kueh brought back memories of my mooncake making experience last year. 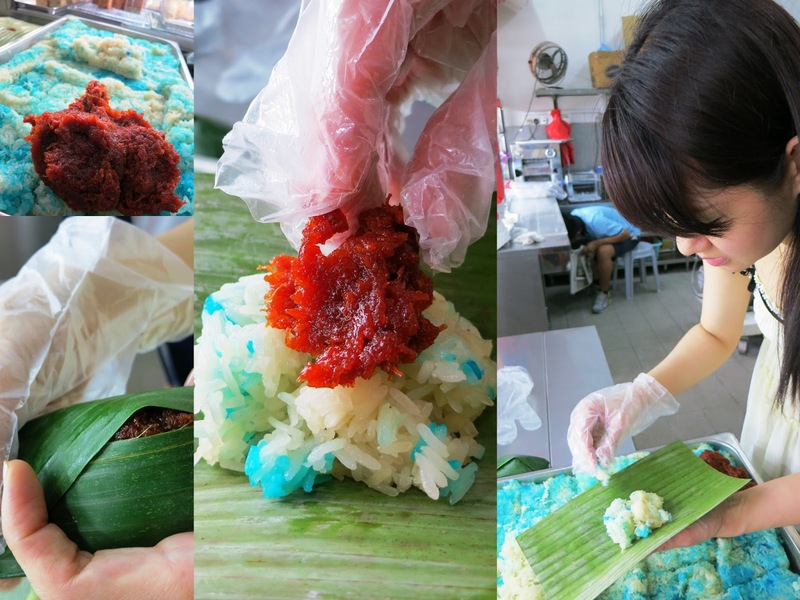 I also tried my hand at wrapping the Pulut Inti, a blue colored glutinous rice nonya snack topped with grated coconut cooked in gula melaka (palm sugar). It looks simple, but it's actually rather difficult in getting the ratio of rice to grated coconut portioned correctly. 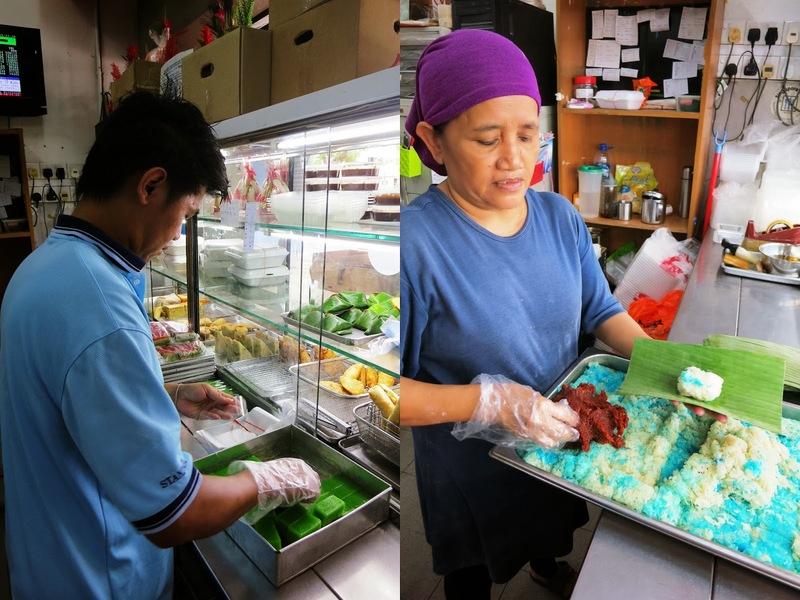 Technique is also needed to fold the banana leaf in such a way so as to create the peep-a-boo effect of the grated coconut in the middle. There's also finer details like pressing the banana leaf firmly down at the corners so that the end product will stay in shape. I tried my best to make all of the Pulut Inti as uniformly sized as possible. Gavin also gave me a tour of Lek Lim's kitchen, which is actually the area just behind the shop front. 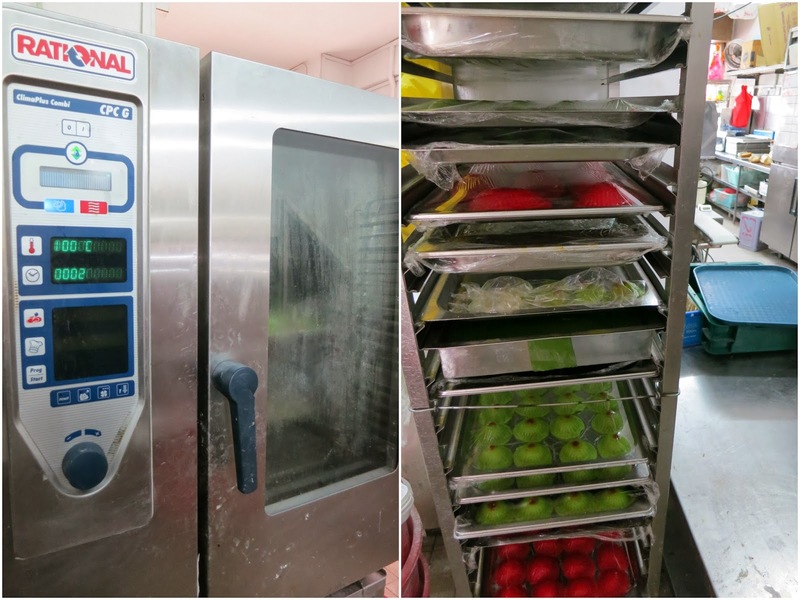 The area is not big, but sufficient to host the necessary equipments like steamer, oven, cooling racks etc. I'm pretty amazed that the team can churn out such a wide variety of kuehs within this small kitchen. The trip wouldn't be complete without a tasting of all the kuehs! I'm so glad I was meeting my BFF and friends right after the Lek Lim's visit to share the delectable treats with them. 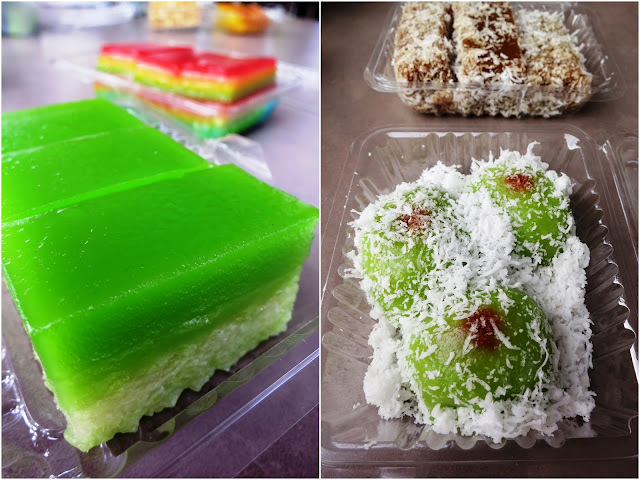 Way before rainbow cakes or rainbow pancakes came into fad, there is already the Kueh Lapis, which I call the rainbow kueh! My brother and I used to peel the rainbow kueh off by layer by layer and roll it up, before sending it into our mouths. I still don't know why we love to eat it that way when we were kids but it sure brings back lots of memories. This is the box of Ang Ku Kueh which I've made. Needless to say, I proudly told my friends that these are lovingly handmade by me so it's a must-eat haha! The kuehs with their sticky chewy skin and fragrant crunchy peanut filling is a hit! BFF especially adore the moist grated coconut filling which is bursting with robust gula melaka flavour in every bite. I was at Lek Lim for only a little over an hour, but the sweltering heat of the kitchen is enough for me to make a beeline for a cooling sugarcane drink at the nearby Fengshan hawker centre as soon as I left the place, feeling extremely drained and looking totally unglam. Can you imagine the team working for long hours in the hot and stuffy environment every day, for the purpose of bringing us a taste of handmade tradition at its freshest? Each little kueh is so effortlessly easy to eat, but takes so much effort to make. Appreciate every bite. Thanks to Gavin for the invitation. Wow, those kuehs are mouthwatering! I went to bedok recently for the bedok 85 bak chor mee. It was a waste that the confectionary was closed. Would have love to savour their kueh again!